Florida Atlantic University’s College of Engineering and Computer Science announced that its Bachelor of Science in Geomatics Engineering (BSGE) program has received accreditation from the Accreditation Board for Engineering and Technology (ABET). FAU is the sixth school in the United States to have an accredited geomatics engineering program, the other five being: California State Polytechnic University, Pomona, CA; California State University, Fresno, CA; Ferris State University, Big Rapids, MI; New Mexico State University, Las Cruces, NM;Pennsylvania State University, Wilkes-Barre, PA. The College of Engineering and Computer Science launched the program in 2007 in response to the 2005 change in Florida Statutes requiring that individuals seeking state licensure as professional surveyors and mappers be trained at the baccalaureate level. Geomatics is a term that incorporates “surveying and mapping” and other aspects of spatial data (information that has a location) management. Geomatics engineers are involved in a wide variety of information gathering activities and applications. They design, develop and operate systems for collecting and analyzing spatial information about the land, oceans, natural resources and manmade features. 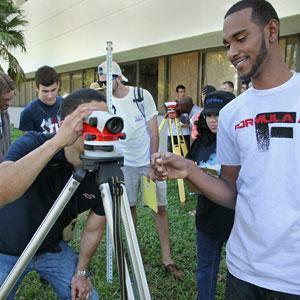 The undergraduate program in geomatics engineering at FAU leads to a 120-credit, four-year bachelor of science degree in geomatics engineering (BSGE). This program provides students with the professional skills required for today’s geospatial specialist. For more information, contact Don Leone at 561-297-3104 or geomaticseng@fau.edu, or visit www.cege.fau.edu.